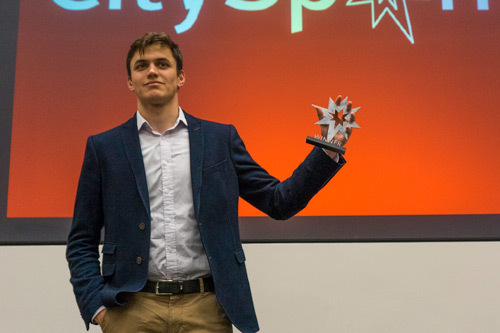 Five student startups have won a £5,000 prize each at the CitySpark live final. 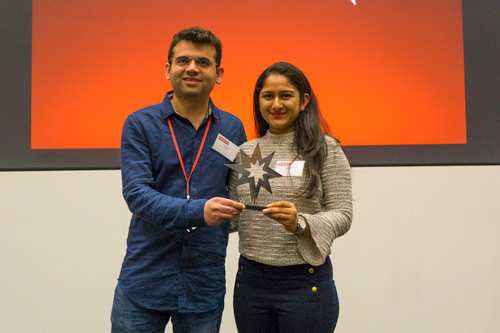 CitySpark is a business pitching competition that helps City students and recent alumni to develop an idea, test it out with potential customers and win funding to make it a reality. 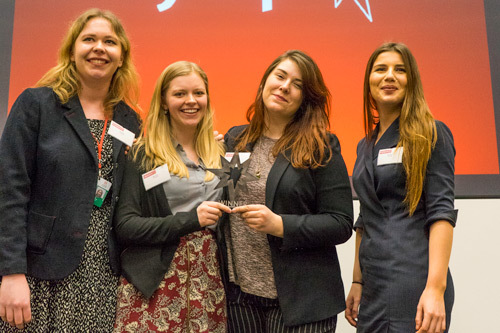 Among the winners at the 2017 live final were vegan food companies, interactive news games and a virtual reality real estate tool. From a record-breaking number of entries, just ten teams were selected to take part in the live final. During the event, teams pitched their ideas to a panel of expert judges including: Andrew Lynch, Co-Founder of Huckletree; Professor Caroline Wiertz, Professor of Marketing at Cass Business School; Jenny Anderson, Strategist; Jody Osborn, Co-Founder at The Backscratchers and Richard Smith, the University Relationship Branch Manager at Santander UK plc. Previous winners of CitySpark have found ongoing success with their business. Eco-friendly wet wipe company Twipes won the Mayor’s Entrepreneur’s Award earlier this year. Competitions like CitySpark truly do inspire me. The volume and quality of ideas is astonishing and I am humbled to play a small part in the entrepreneurial success of our students and graduates. 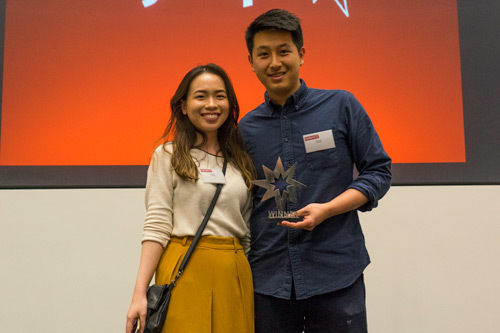 Liz Nguyen (MSc Marketing Strategy and Innovation, 2016) and Joseph Tam (MSc Marketing Strategy and Innovation, 2016) met on their course at Cass Business School. Their idea, EatChay is a vegan food business, putting a twist on popular Asian comfort dishes. Their aim is to make vegan food accessible and enjoyable and encouraging consumers to reduce their meat consumption by showing them that vegan food can be both healthy and satisfying. From small beginnings, Liz and Joseph now serve hundreds of customers with pop up food stalls across the capital. It was great to see so many people being pleasantly surprised by how good vegan food could taste. We're overwhelmed with the amount of support we received. Their dream is to open a 100% vegan “grab-and-go” lunchtime restaurant. Their future plans are to open a pop-up at Appear Here space in Old Street Station or one of many alternative spaces across London and will put the prize money toward expanding their business. Vladimir Gasanov is currently studying Business Studies and was joined at CitySpark by Martin who studies Computer Science. Their idea, Veldt View, is a cloud-based virtual-reality real estate tool. It allows non-technical real estate developers to create, view and interact with 3D models of developed properties. Vladimir Gasanov came up with the idea after working at a real estate development firm and noticing ways to make things more efficient. “I have a real interest in Virtual Reality/Augmented Reality technology. The overlap of the two areas shaped the idea,” he said. When you are trying to create something completely different than everything else in the market, you are stepping into the unknown. In this situation it feels amazing to see that your product gets people excited and to hear that they would love to use it. The team will spend the £5,000 prize fund on additional hardware and product development. Student Circus is a job-search platform aimed at international students in the UK. Jobs and internships are pre-filtered from employers who are willing to sponsor a work visa. Tripti Maheshwari (Msc Finance, 2016) and Dhruv Krishnaraj (who studied at Bristol) say Student Circus was borne out of a problem they faced as international students. After graduating, they both spent significant amounts of time searching for jobs, while knowing they needed a work visa. Student Circus aims to make that job hunt easier. 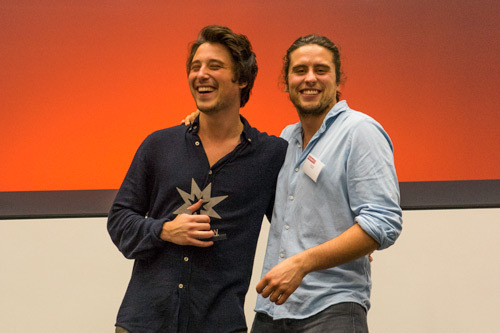 With so many brilliant pitches and people, we are proud to have won CitySpark this year. This gives us the much needed boost to keep going and achieve our goals. They plan to spend the prize money building and launching the app. Cambria Bailey-Jones, Eleanor Smallwood, Gabriela Jones and Georgina Righton are all studying Broadcast Journalism. They came up with Wordplay - their interactive news game, as part of a class project. WordPlay is the world’s first audio-only newsgame for screenless devices. It allows players to engage with news stories on an interactive level. Bombinate is a luxury online marketplace, providing the world’s finest brands with digital services and content opportunities. Bombinate’s mission is to create the ultimate online destination for men who care about quality. They plan to split the money between marketing campaigns and brand on-boarding activities during the next six months.